QEMU (short for "Quick Emulator") is a free and open-source software product that performs hardware virtualization. 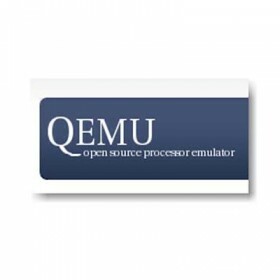 QEMU is a hosted virtual machine monitor: It emulates central processing units through dynamic binary translation and provides a set of device models, enabling it to run a variety of unmodified guest operating systems. It also provides an accelerated mode for supporting a mixture of binary translation (for kernel code) and native execution (for user code), in the same fashion VMware Workstation and VirtualBox do. QEMU can also be used purely for CPU emulation for user-level processes, allowing applications compiled for one architecture to be run on another. QEMU can save and restore the state of the virtual machine with all programs running. Guest operating systems do not need to be patched to run inside QEMU.